Rich ran cross-country and track in high school and was approached with a college scholarship opportunity but walked away from it. From a family of non-runners, he ran races in grade school & was heavily invested in running through high school. His BQ experience was the driver behind the development of (Twitter-based) #BqChat. Rich has been a big support of the Boston Qualifier Questionnaire project. Thanks so much for taking part, Rich! Weight (at the time of first BQ): 130 – 135 lbs. The Maine Coast Marathon (3:11). It was my second 26.2. I understood that every second below BQ translated into improved odds of getting into Boston. I wore two wrist pace bands. A 3:15 “minimum” BQ band on my right (for Age Group 40–44) and a 3:10 “optimistic” band on my left. I ran optimistically as long as I could that day. It’s hard for a former cross-country guy to NOT go like hell the whole race. It’s exactly what I did at my first 26.2 and my poor showing reflected it. My new mantra was to have the courage to go out slow. When the gun went off I fell right into marathon pace (and was promptly smoked by a group of runners). I seethed. A runner still nearby got my attention and said, “You’re gonna have fun picking them off later in the race.” That helped me relax. And he was right. It was fun. Note: This is a Mother’s Day race. I felt selfish registering for it. Like I had taken Mother’s Day away from both my mom and my wife (mother of our two kids). Their response? Attending the race with cowbells and BQ cheer signs. I still get emotional about it. Their support on that day pushed my level of determination out of bounds. I did a lot of running in my youth. Always yearning for that runner’s high (although I wasn’t familiar with the term “endorphins”). I just knew running made me feel good. I didn’t excel at every sport. But I could run. Unknown. Unfortunately, my dedication to running in my youth didn’t carry into adulthood. I consider this a personal example of not living life to the fullest. As age 40 approached I finally decided I wasn’t ready to close the book on my run. More recently, I average 1,000 miles annually. Which I acknowledge isn’t a lot compared to my BQ peers. But between family, work and staying healthy, it’s what works for me. Two 13.1s & one 26.2. I love 13.1s and notched my PR in the event that year: 1:26. I haven’t come across a canned program that’s aware of the day-to-day status of my left knee. But it’s important to be aware of proper training methods. For a good knowledge base I recommend completing the Road Runner’s Club of America (RRCA) Coaching Certification course. Overall, the key for me is balance. Listening to your health, evolving physical ability and years of running experience goes hand-in-hand with the canned programs. Balancing a young family, work and living in a remote area isn’t very conducive to club running or being coached. My cross training consists of crunches and foam rolling on my non-run days. Crunches make me feel leaner. Faster. And rolling preserves my hamstrings. Also, I live on 3.5 acres in the Granite State. There’s always a rock wall that needs work. Hills and fartleks are the keys to my run. I’m surrounded by hills and I’m thankful for them. When I feel like punishing myself I practice marathon pacing in those hills. “Run over hills, not just to the top.” –Greg McMillan. Any other thoughts you would like to share with those of us working towards a BQ? Qualifying for Boston is a lifetime goal. (After all, nearly anyone that runs Boston considers it a life event.) Acknowledge it can take years. Study your past 26.2 experiences. Vividly recall injuries and how you got there. Proper nutrition as you age is vital. Anyone that says “I’ll just have to get older” in order to BQ isn’t considering the effects of aging on the human body. Practice running on an empty stomach to burn fat (carefully). Recognize there’s a special place in heaven for the spouses of BQ chasers. Finally, maintain a healthy mental perspective and try not to overwhelm yourself with qualifying for Boston. 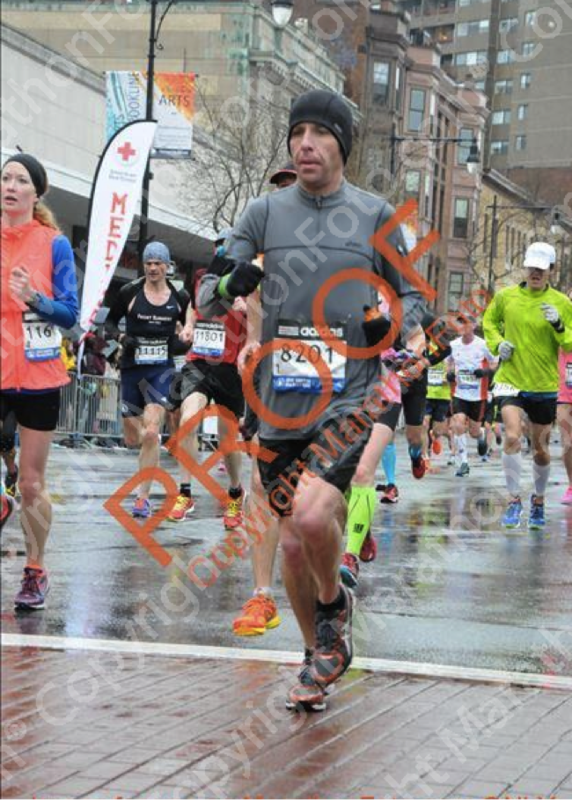 “PROOF” I ran the 2015 Boston Marathon.